At this time of year I pretty much wake up every day with an impossible list of things I have to accomplish. Between running around taking care of my usual to do’s, I’m in the midst of Christmas shopping, wrapping, decorating, baking, getting Boy #4 fitted for his tux for the winter formal, taking the dogs to the vet, cleaning the carpets, getting the spare room ready for guests, and on and on and on. Oh yeah, and then there’s work. I have to do that too. I’m so tempted many nights to throw my hands up in the air and say “we’re eating out” but there’s only so many nights you can get away with that. That’s where this recipe comes in. This is not gourmet cuisine. 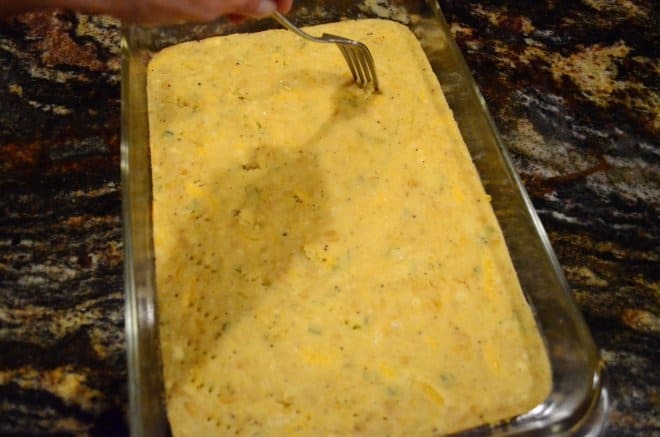 This is a down home, old school casserole. 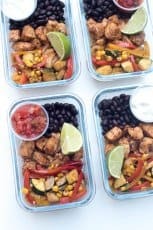 The type of dish you’d bring to the potluck at the school or take to the neighbors down the street who just had a new baby, or in my case – throw together for your family on a crazy, busy day. 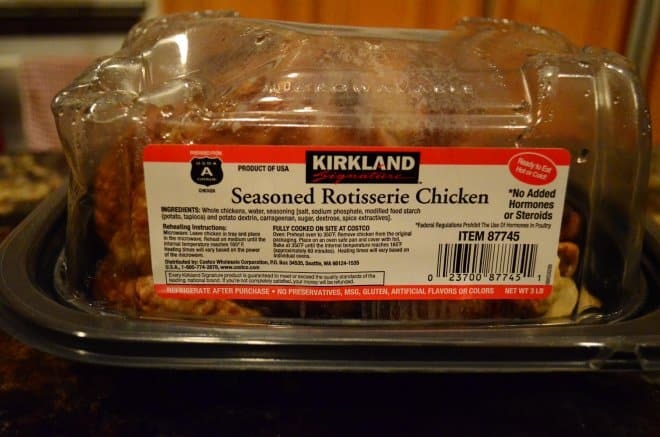 When I go to Costco, I almost always pick up one of their rotisserie chickens. They are big, plump, juicy and so cheap! The price is typically less than an uncooked bird at the grocery store and all the work is done for you. I’m at the point in my life where I get excited by these kinds of things. I recommend pulling all the meat off the bone as soon as you get home, while it is still a bit warm. It will come off easily and then you can just bag it up and store it in the fridge. Freeze it if you aren’t using it within a day or two. 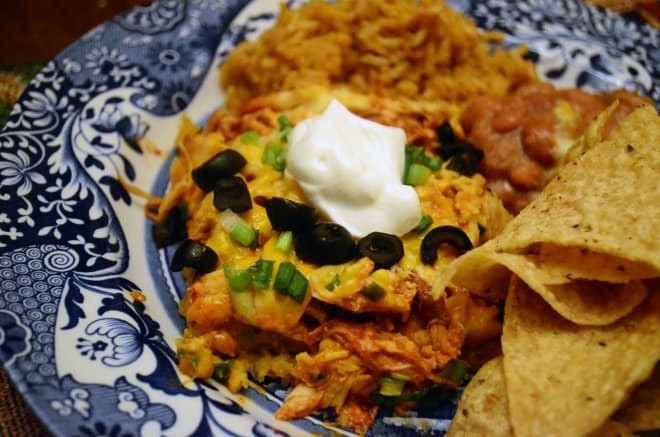 We are going to use this one right now to make Chicken Tamale Casserole. 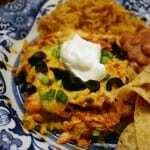 Mix together the base layer – 1/2 cup of shredded cheddar/jack cheese, milk, egg, cornbread mix, creamed corn, diced green chiles, cumin, and pepper. 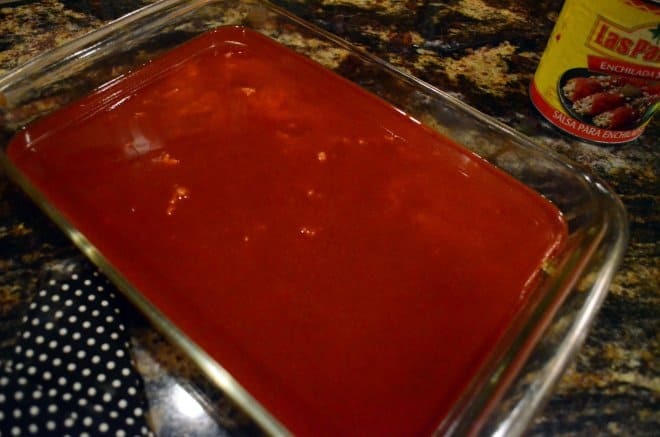 Pour the mixture into a 13 x 9 pan that has been coated with cooking spray. Pop it in a 400 degree oven for 15 minutes. 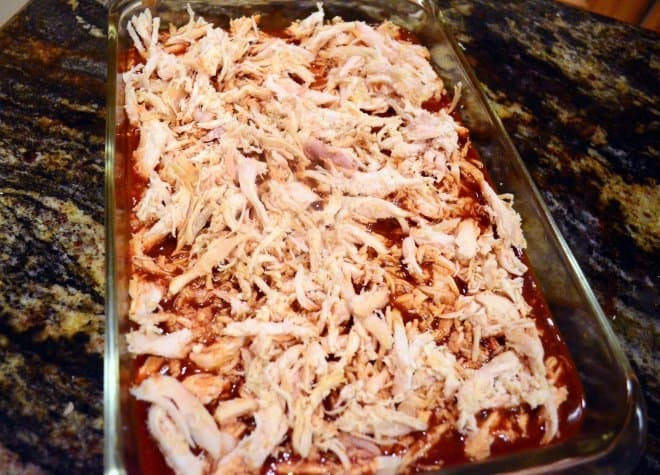 Pull it out of the oven and pierce the surface with a fork to get it ready for the enchilada sauce. 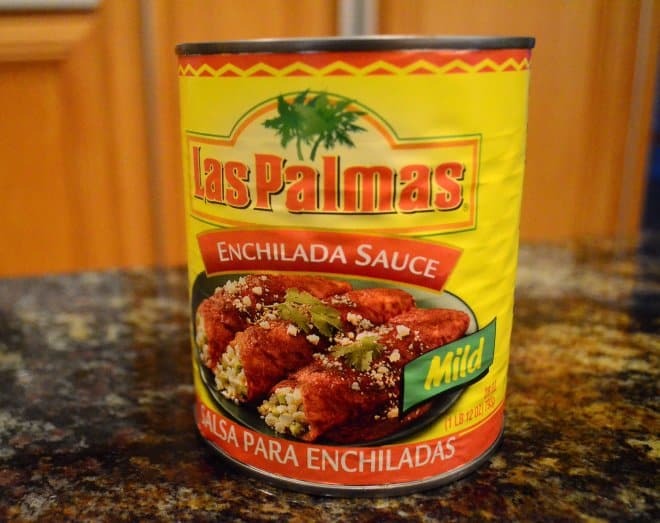 I like this Las Palmas Enchilada Sauce. It’s mighty good for a prepared sauce. You can control the heat level in this dish by using the hot version but I’m going mild here. Now just pour the enchilada sauce over the base. 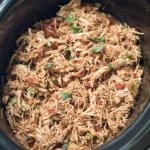 The shredded rotisserie chicken goes on. Sprinkle with the remaining cheddar/jack cheese. See how easy this is? I’m telling you! It’s time for it to go back in the oven for another 15 minutes. Remove it from the oven and sprinkle it with the olives and green onions. Return to the oven for just a few minutes and it’s dinner time! 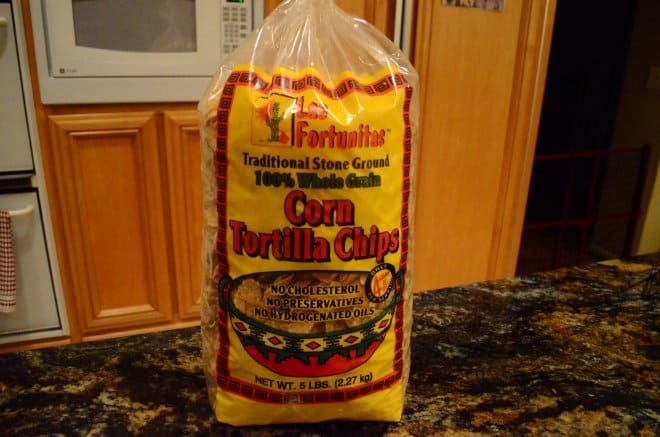 My husband laughed at me when I bought this bag of tortilla chips. It’s as tall as a small child. I like tortilla chips. Fast and easy, warm and delicious. Now go kick your feet up and let someone else do the dishes. Spray a 13 x 9 pan with cooking spray. 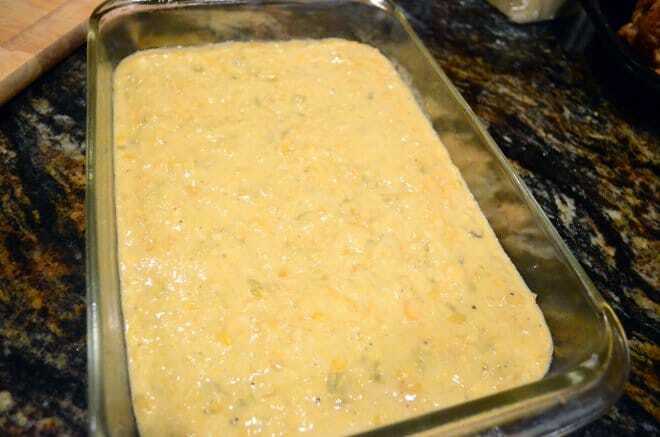 In a large bowl mix together 1/2 cup cheese, milk, egg, cumin, pepper, creamed corn, cornbread mix, and green chiles. Pour into prepared pan. Bake for 15 minutes or until set. Remove pan from oven and pierce surface liberally with a fork; pour enchilada sauce over top. 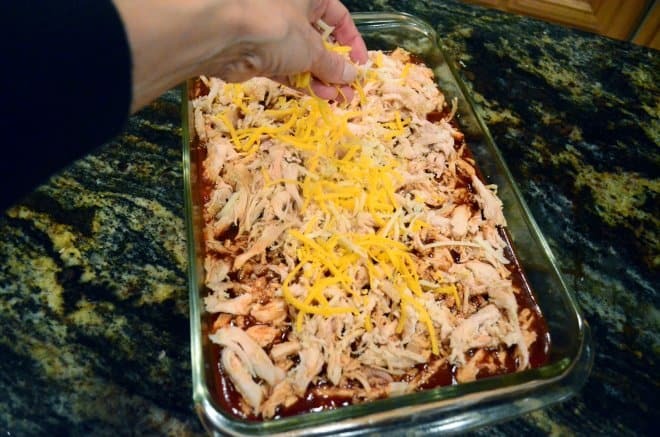 Top with chicken, sprinkle with remaining cheese. Bake at 400 degrees for an additional 15 minutes or until cheese is melted and bubbly. 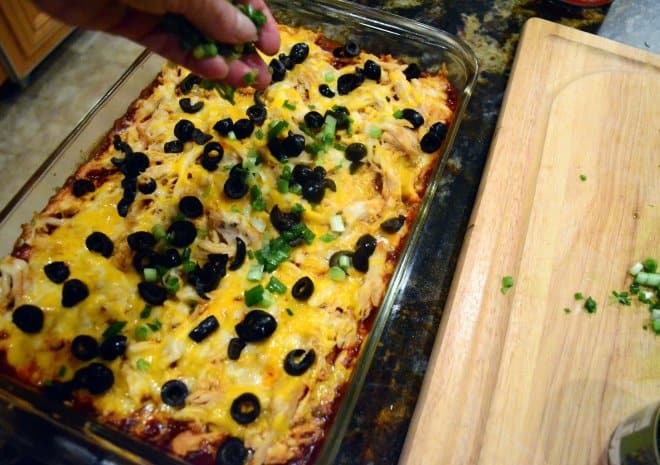 Remove from oven and sprinkle with olives and green onions and return to the oven for an additional 3 or 4 minutes. Remove from oven and let stand for 5 to 10 minutes. Cut into squares and serve with sour cream and tortilla chips on the side. These pictures are beautiful. 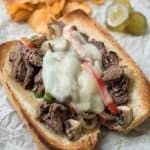 This recipe is really nostalgic for me. I grew up always eating tamale pie. It makes me think of that!!! Thanks for sharing. 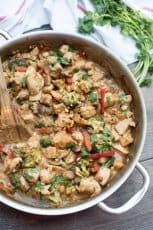 I have a recipe almost exactly like yours from Cooking Light and it is our go-to when we have a busy night ahead of it. 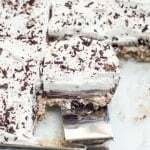 It is soooooooooo tasty, delicious and easy to make. Yum yum yum!! I hear ya about the busy days right now…I can’t wait for Christmas to be here so I can just relax and eat! Valerie, you are my new BFF! Nice to meet you girlfriend! Omg my guys would go nuts for this. Really incredible. I LOVE the way you made up the cornbread and cooked it first! What a great idea! A perfect meal for the cold wintry weather we’re having right now. OH MY! This looks so incredible and so easy to make. I love buying those roasted chickens from the grocery stores. They are incredibley handy. I am gonna try this. My family would love it. So glad I found your site!!!! Wow Valerie! That looks sensational! I just discovered your site today via Stumble Upon. It sounds like we’re living our lives in parallel! 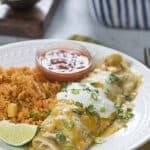 I too have 4 sons (ages 17 – 23) and they are Mexican food fanatics. 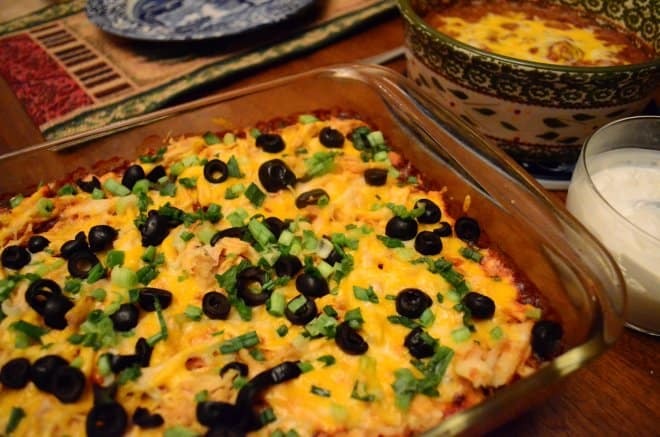 Although I grew up making Mexican food with my family, I never learned tamale pie. As I write the cassarole is in the oven and the boys are hovering (you can relate!). 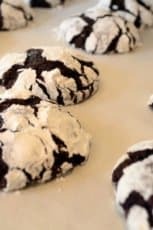 Thanks for the wonderful, easy recipe! Welcome Maria! Another woman with 4 sons who has lived to tell her tale 🙂 We have to stick together. 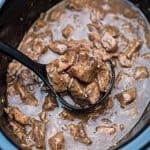 I hope you find lots of inspiration and recipes here that you can use to feed all those men. do you have to use cream corn? I grew up eating so much of that stuff I can’t stand it now but I love niblets!!!!! You could try it with the niblets, Cheryl. Creamed corn has a lot more moisture to it but I think it could still work out. 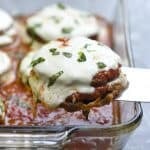 I can’t wait to make this one, and so easy….love Las Palmas sauce. I made this with homemade enchilada sauce and it was good, but my family and I don’t care for the sweet taste. I wonder if I can make this with regular can of corn? Thank you for sharing, this is going to be our dinner tonight!